Lynn Guenther was born in 1945 in Glasgow Valley, Montana. He was commissioned through the Air Force ROTC program on June 2, 1968, and went on active duty beginning July 24, 1968. Lt Guenther next completed Undergraduate Pilot Training and was awarded his pilot wings at Webb AFB, Texas, in August 1969, followed by survival training and KC-135 Stratotanker Combat Crew Training from September to December 1969. His first assignment was as a KC-135 pilot with the 909th Air Refueling Squadron at March AFB, California, from December 1969 to January 1971, during which time he deployed to Southeast Asia twice between April and June 1970. He then completed Forward Air Controller training and OV-10 Bronco Combat Crew Training before serving as an OV-10 pilot with the 20th Tactical Air Support Squadron at DaNang and Pleiku AB, South Vietnam, and then at Nakhon Phanom Royal Thai AFB, Thailand, from August 1971 until he was forced to eject over North Vietnam and was taken as a Prisoner of War on December 26, 1971. After spending 414 days in captivity, Capt Guenther was released during Operation Homecoming on February 12, 1973. He was briefly hospitalized to recover from his injuries at Travis AFB, California, and then received an Air Force Institute of Technology assignment to complete his master's degree in business administration at the University of Oregon from September 1973 to June 1975. His next assignment was as Chief of the Customer Assistance Section and Chief of the Personnel Utilization Section in the Consolidated Base Personnel Office with the 2852nd Air Base Group at McClellan AFB, California, from July 1975 to July 1977, followed by service as Assistant Professor of Aerospace Studies with the Air Force ROTC detachment at Oregon State University from July 1977 to January 1979. Maj Guenther then returned to flight status as a KC-135 pilot with the 46th Air Refueling Squadron of the 410th Bomb Wing at K.I. Sawyer AFB, Michigan, from May 1979 to July 1982, and then served on the staff of Headquarters Strategic Air Command at Offutt AFB, Nebraska, from July 1982 to January 1985. His next assignment was as Operations Officer for the 46th Air Refueling Squadron from January to October 1985, and then as Commander of the 307th Air Refueling Squadron at K.I. Sawyer AFB from October 1985 to April 1987. Col Guenther served as Advanced Echelon Team Chief for activation of the KC-135R with the 341st Strategic Missile Wing from April 1987 to January 1988, followed by service as Assistant Deputy Commander for Operations and then Deputy Commander for Operations of the 301st Air Refueling Wing at Malmstrom AFB, Montana, from January 1988 to June 1991. His final assignment was as Commander of the 92nd Support Group of the 92nd Bomb Wing at Fairchild AFB, Washington, from June 1991 until his retirement from the Air Force on August 1, 1994. 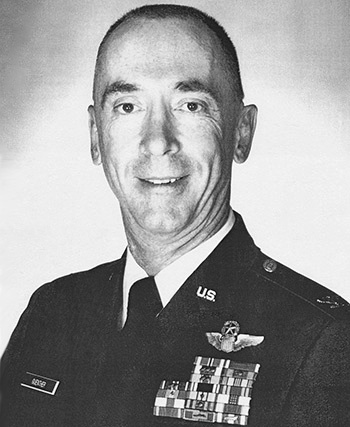 Captain Lynn E. Guenther distinguished himself by extraordinary achievement while participating in aerial flight as a Forward Air Controller in Southeast Asia on 24 December 1971. On that date, Captain Guenther demonstrated courage and rare determination while directing air strikes against a truck convoy deep in hostile territory. Despite marginal weather, lingering darkness, and an intense barrage of antiaircraft fire, Captain Guenther skillfully controlled six flights of fighter aircraft, resulting in the total destruction of a seven truck convoy. The professional competence, aerial skill, and devotion to duty displayed by Captain Guenther reflect great credit upon himself and the United States Air Force.